Srinagar, August 10: The Indian Army on Thursday busted a terrorist hideout and seized a huge cache of arms and ammunition during the search operation in Poonch district of Jammu and Kashmir. This comes a day after security forces sent five terrorists to the graves after a gun-battle took place in the forests of Hamam in Baramulla district. A team of Indian Army on the basis of specific input launched a search operation in the KP Nala area of Mandi tehsil in Poonch district of Jammu and Kashmir and recovered a large number of arms, ammunition and explosive materials. The recoveries include one 9mm Pistol, three magazines of a pistol, four rounds of 9mm pistol, four carrying bags, one AK-56 rifle (with sling), three magazines of AK-56 rifle with ammunition, one unidentified weapon, one revolver, 14 hand grenades and one AK-47 bayonet and other warlike stores. 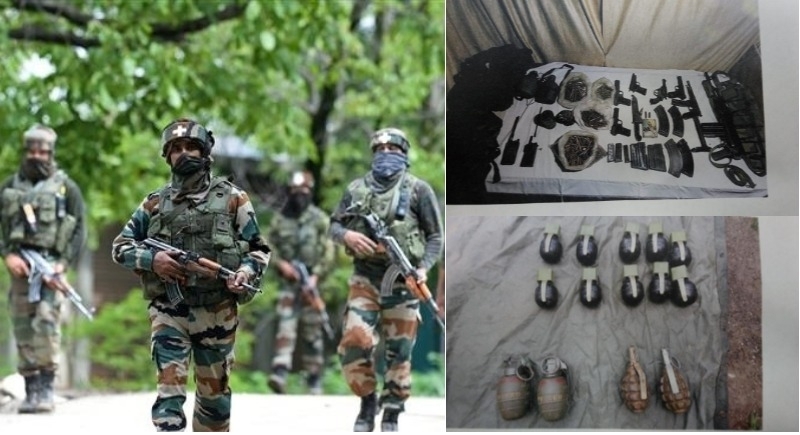 Last month, Jammu and Kashmir police busted a terrorist hideout and seized detonating material, connecting wires, electric chargers, batteries, mobile phones and remote control activating devices and some items marked with symbols of Pakistan. Four days before the Jammu and Kashmir police arrested a Jaish-e-Mohammed (JeM) terrorist from Anantnag. A huge cache of incriminating material and explosives were also seized. Another terrorist belonged to Gazwat-Al-Hind was also arrested along with 8 grenades. On August 4, five terrorists belonged to Lashkar-e-Toiba (LeT) were killed in Kiloora village in Jammu and Kashmir's Shopian district. The terrorists were identified as Arshad Ahmad Khan, Aijaz Ahmad Paul, Waqar Ahmed Sheikh and Umar Nazir Malik. Earlier, the centre has said that 110 terrorists were killed in the first seven months of this year.